Microsoft Outlook when used with Exchange server creates OST(Offline Storage Table) file which is stored locally on users’ system and contains the copy of mailbox items. 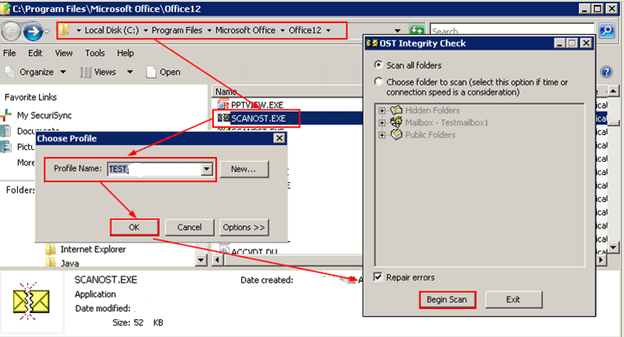 OST file is used when the connection to Exchange Server is not online, then user can work with this OST file and the changes made to OST file during this period are later synchronized with Exchange server once the connection is established. When the connection to Exchange Server is available MS Outlook tries to synchronize the OST file with Exchange Server mailbox but sometimes due to some unexpected reasons like–abrupt system shutdown or slow connection don’t allow the process to complete. These type of errors may cause OST file to get inaccessible and corrupt. Microsoft has discontinued scanost.exe from Outlook 2010 and newer versions of Outlook also scanost.exe is not that efficient on large OST files or when the corruption is high. So if you using MS Outlook 2010 and later versions you must rely on some third party OST Repair Tool to to the task for you.